These two timing parameters directly affect the communication between your RIG and GBCAT. A default values off these parameters are written in “GBCAT.cfg”, and represents a compromise values for most RIG brands and models. However, there are always differences, even among devices of the same manufacturer and the same model. Compromise is not always the best possible solution, so in some cases there may be a need for playing with these two timing parameters, to achieve the maximum communication performance. RIG Polling Delay (in milliseconds), is a required time while GBCAT wait on response from your RIG. If the communication speed is higher, the response time is shorter, so the RIG Polling Delay value has to be lower. TXD Line Polling Delay acts like a divider for the RIG Polling Delay value. The result is a value in milliseconds, which represents a time required for GBCAT data processing until a new RIG enquiry is generated. If the communication speed is higher, GBCAT processing time need to be shorter. According to that, the TXD Line Polling Delay value has to be higher. Please, have a notice that these default values are tested on a few different RIG brands and models, and represents a recommended values for communication speed of 38400 bps. If you are using a speed lower than 38400 bps, please correct a default values for these timing parameters, according to rules of use. Whether GBCAT could work without these additional timing parameters? Of course it could work without it, but what we wanted to achieve was not a snail’s crawling but cat’s hopping. In other words, we wanted to achieve effective RIG control and ergonomic RIG response at the same time. Therefore, if you want control your RIG better than mediocrity, please play with timing parameters to gain the CAT’s hopping. If you need any other hint or help, please, do not hesitate to contact GBCAT support, after you read GBCAT help file. 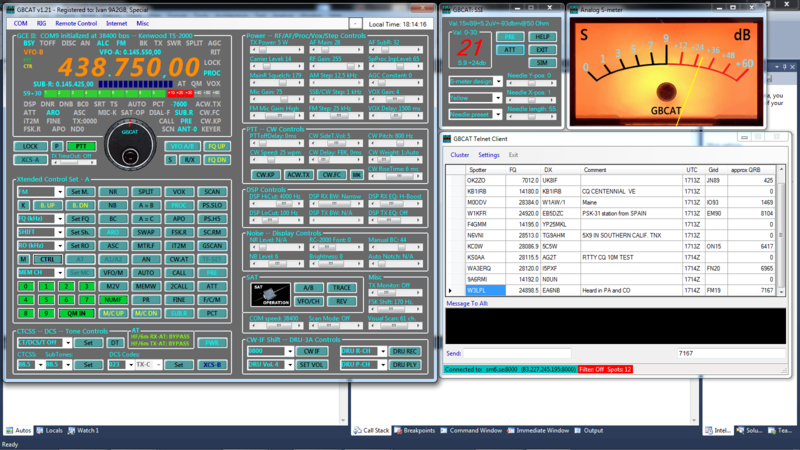 Screenshot: GBCAT v1.3 with a new features: Signal Strength Indicator with user defined face plates, Telnet Client for a most DX clusters, etc.